I finally have something to add to this blog… I hope it is worth it. I am probably the most guilty of creating outlandish summative tasks that hook students in, take days (even weeks!) to finish and look like inquiry at its best. My thoughts have changed a lot over the past couple of years. An Understanding By Design workshop a few years back asked us, “Is the juice worth the squeeze?”. Is it really worth setting up these amazing activities, when you could get the same outcome in 10-20 minutes. Based on the work of Wiggins and McTighe’s Six Facets of Understanding and that spark from Kath Murdoch, I am starting to wonder if this model can help students select their own summative task. 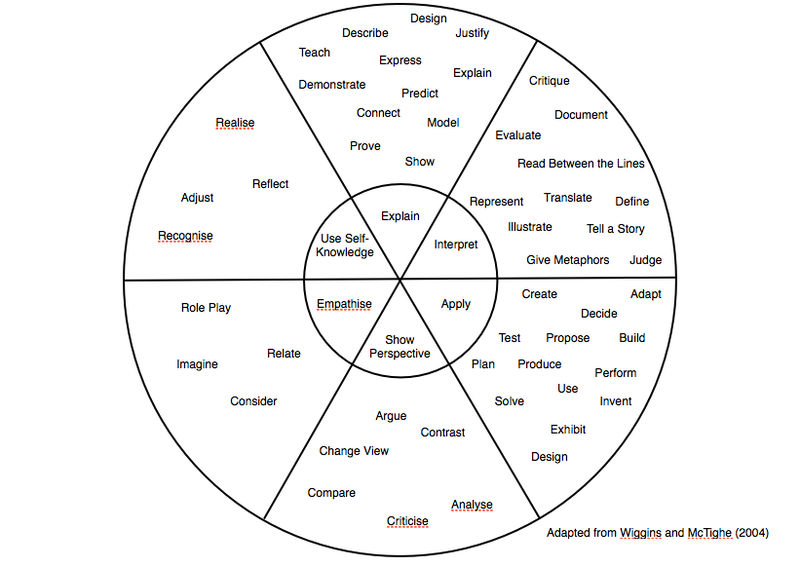 I can _____________ (insert one of the verbs in the middle circle) my understanding of the Central Idea by _____________ing (insert one of the verbs in the outer circle)…. and that is as far as I can get. Obviously the student completes their planned task, but something is missing from the complete equation. Maybe this is where you can come in! I believe that this model helps open it up to a range of possibilities, allows for great transfer of understandings and encourages creativity. Feedback more than welcome! I need to get over the final hurdle.